Photo: Ridley-Lowell Esthetics and Massage Therapy Students (left to right) Back Row: Roseanne Alves, Rendy Raposo, Zachary Totillo, Lauren Robideau; Middle Row: Selinah Tsagae, Hyunyang Murphy, LeeAnn Tarsi, Lupe Heredia; Front Row: Brandy Figueiredo, Claudia Maita, Deirde Clement, Ellen Dennerlein. 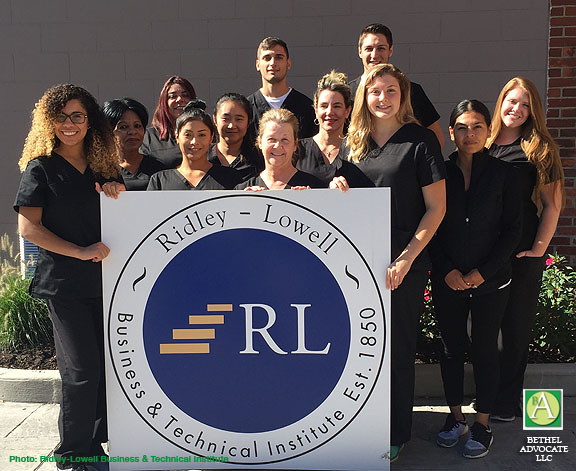 Ridley-Lowell Business & Technical Institute’s Massage Therapy and Esthetics students decided to donate all profits from their public clinic to the Red Cross for disaster relief, on Friday, September 29th, after Texas, Florida and Puerto Rico had multiple hurricanes. The event took place at 44 Shelter Rock Road in Danbury, CT, during their normal school day, which is 8 a.m. – 1 p.m..
All esthetics and massage therapy teachers and students were involved including instructors Kelly McCaffrey and Lori Mikel for Massage, Sheryl Stroud for Esthetics, and sixteen students. They notified their normal clinic clients as well as the general public that we would be donating all profits that day to the Red Cross for disaster relief. The instructors listed above organized the event. The idea was the brain child of the instructors listed above and Lauren Kuzara, Senior Director of Ridley-Lowell. They wanted to do something to help after so many disasters, Kuzara said. “People who practice esthetics and massage therapy are dedicated to using their hands to help others. This fundraiser allowed our students to extend that personal help to reach those in need after the devastation from recent hurricanes,” said Kuzara. Massage students charged all clients $30 for a 50 minute massage or $15 for a 20 minute chair massage. Esthetics students charged all clients $30 for a 50 minute facial or $15 for a 20 minute mini-facial. They raised a total of $345. Ridley-Lowell Business & Technical Institute, a career technical institute, is the oldest trade school in the nation. With four campuses across three states, Connecticut, Rhode Island and New York, we prepare students for an entry-level position in a variety of fields such as Medical Assisting, Massage Therapy, Esthetics, and Electrical Technician Systems.